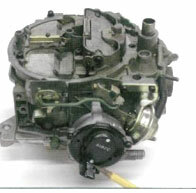 Any carburetor originally equipped with a hot-air-style choke can be converted to an electric choke in minutes. The vacuum supply to the housing must be blocked off and the gasket under the choke discarded because the unit uses the housing as a ground. An electric choke can significantly improve cold-weather operation over other original choke styles. Any carburetor originally fitted with a hot-air thermostatic choke coil can easily be converted to the later GM electric choke. However, to prevent a vacuum leak, the hot-air choke uses a gasket between the choke coil and housing. Since the housing acts as a ground for the electric choke, this gasket must be omitted and the vacuum sources plugged when converting. New electric coils should be available from your local parts store or even a junkyard. All that’s needed for proper choke operation is a 12-volt power source that is activated when the ignition key is in the “ON” position. A good power source location is at the windshield wiper motor. It is usually mounted on the firewall behind the engine and has a wire that is activated when the key is switched to the “ON” or “RUN” position.